One Ocean Expeditions (OOE), is offering the opportunity to go further south of the Antarctic Circle than was previously possible on any of its other cruise expeditions, with the launch of a newly developed Antarctica ‘Deep South’ itinerary for the 2017-18 season. It is one of four new itineraries from the polar cruise specialist, which also include expeditions taking in the New Year in Antarctica, Christmas in South Georgia, plus a 17-night trip featuring whale, fur seal and penguin chick spotting. Christmas in Antarctica, South Georgia & Falklands, 14-30 December 2017: By using two flights – outbound from Punta Arenas in Chile to King George Island in the South Shetland Islands (Antarctica) and return from Stanley in the Falklands to Punta Arenas - this 16-night expedition reduces time at sea, a llowing more in-depth exploration of the destination with four days on the Antarctic Peninsula and four days, including Christmas Day in South Georgia. Highlights include Elephant Island, named aptly by early explorers who saw elephant seals on the shore. This remote spot provided refuge for Ernest Shackleton and his crew following the loss of their ship, the Endurance, in the ice of the Weddell Sea. Prices start from US$15,295 per person based on triple share on board the comfortable expedition cruise ship, One Ocean Voyager (Akademik Sergey Vavilov). 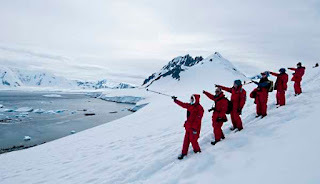 Antarctica and South Georgia, 28 December 2017 - 13 January 2018: Passengers will see one year out and the next year in on this 16-night voyage, which packs in all the highlights of a traditional 18-night itinerary by saving a day and a half at sea, using a flight at the end of the voyage from Stanley in the Falklands to Punta Arenas, Chile. With three days spent in South Georgia, there is plenty of time to appreciate the wildlife, including enormous colonies of king penguins, which often share the beaches with fur and elephant seals and gentoo penguins, while giant petrels and other sea birds swoop overhead. Prices start from US $14,795 per person based on triple share on board the ice-strengthened expedition cruise ship, One Ocean Navigator (Akademik Ioffe). Falkland Islands, South Georgia and Antarctica, 3- 20 February 2018: Once again, by flying out of Punta Arenas to Stanley, Falklands Islands and disembarking in Ushuaia, this reduces travel at sea and allows all the locations of a longer voyage to be visited on this 17-night itinerary. This is the perfect time of year for spotting whales as migrating pods visit Antarctica’s rich waters, as well as enjoying the sight of fur seals along the Peninsula and penguin chicks, which are increasingly independent and actively diving. This is a favourite for photographers – amateur and professional – as well as nature lovers. Prices start from US $16,395 per person based on triple share, travelling on the One Ocean Navigator (Akademik Ioffe). Antarctic – ‘Deep South’, 20 February – 3 March 2018: This itinerary usually requires 13-nights. However, due to the inclusion of the flight from Punta Arenas to King George Island, combined with disembarkation in Ushuaia, two days at sea are saved in transit and added ‘in destination', allowing travel further south of the Antarctic Circle than on other voyages. Detaille Island, just beyond the Antarctic Circle, is the site of Britain’s Base W, which had to be evacuated in a hurry in 1958/9, leaving an eerily preserved time capsule of 1950’s Antarctic life. Marguerite Bay, well below the furthest point of most ships, is home to two important science stations and J ohn Rymill’s southern base for the early 1930’s British Grahamland Expedition. Weather permitting this cruise will include visits to these historic locations. Prices start from US $11,495 per person based on triple share, on board the One Ocean Voyager (Akademik Sergey Vavilov). Early booking incentive - There is an early booking incentive of US $1000 per person available on all new bookings received by 1 November 2016.